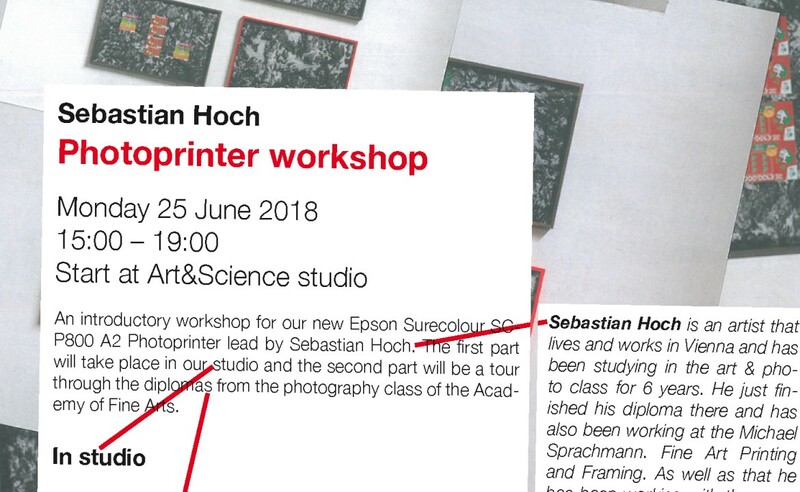 An introductory workshop for our new Epson Surecolour SC-P800 A2 Photoprinter lead by Sebastian Hoch. The first part will take place in our studio and the second part will be a tour through the diplomas from the photography class of the Academy of Fine Arts. Sebastian Hoch is an artist that lives and works in Vienna and has been studying in the Art & Photography class of Martin Guttmann for 6 years. He just finished his diploma there and has also been working at the Michael Sprachmann. Fine Art Printing and Framing. As well as that he has been working with the same printer that we have for the last few years, so we’ve asked him to share with us his workflow, process and tips with handling the printer.